Bentleigh made the journey across the West Gate on Friday night to take on Altona Magic at Paisley Park. For the Greens it was a chance to capitalise on the momentum gained from their 3-2 victory against Oakleigh from the week before and for the hosts it was a chance to consolidate their position in the middle of the NPL table. Bentleigh went into the game with a largely untried line-up with under 20’s player Marios Gerondaras deputising at right-back. Altona got proceedings under way after 26 minutes with their first real foray forward. Winger Sami Nour got on the end of a ball across the area and spectacularly beat Ryan Scott with a flying overhead kick from the edge of the area. Bentleigh winger Arnold Suew then had a effort cleared off the line shortly after. The sides went into the sheds at half time with the score in the Magic’s favour at 1-0. Immediately after the restart Altona made it 2-0 when Daniel Kuczynski’s effort took a deflection off Bentleigh skipper Jack Webster and found the back of the net. Altona then made it 3 on 72 minutes when an on rushing Ryan Scott misjudged a ball played over the top and allowed Michiel Hemmen in behind who tapped into an unguarded net. 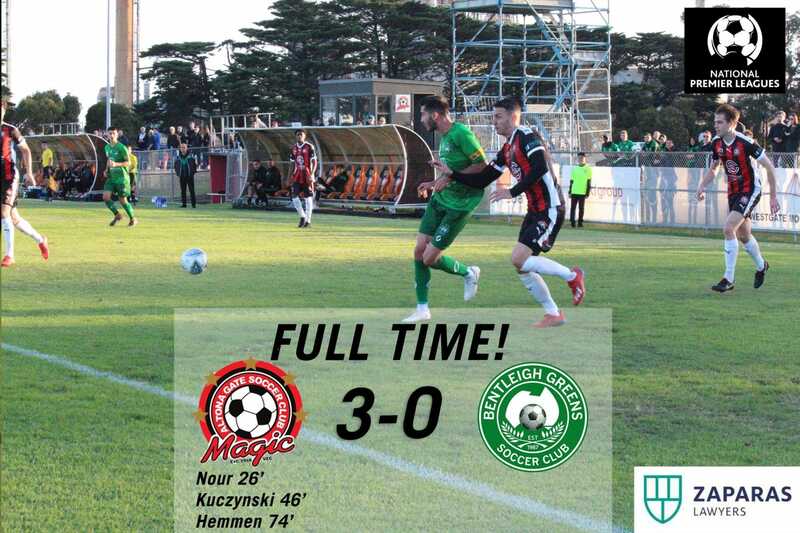 The score finished at 3-0 with the Greens failing to trouble the Magic goal. Next week Bentleigh travel to Olympic Village to take on Heidelberg United on Saturday night.